This week I am pleased to bring you a collection of reviews of books from the Lion Forge family. Today ends my official Lion Forge Week, but I’m not done with Catalyst Prime, the Lion Forge hero line, so stay tuned, for I will bring you more about that cool run as the days go on. Today’s title is one of love and ghosts! 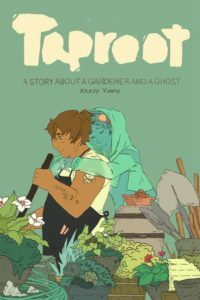 Taproot is the tale of a young, skilled flower shop worker named Hamal that can talk to ghosts. He’s been able to do this for a very long time. So long in fact that he doesn’t even feel it to be weird. One of the ghosts, Blue, has an obvious crush on Hamal, and they have a constant flirtatious back and forth. 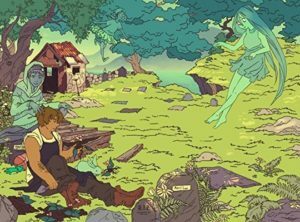 As the tale goes on, and each character is living a fairly normal, happy life, Blue gets tossed into a sort of forest limbo. Blue discovers that a reaper is looking for a necromancer that has been communicating with the dead. The reaper attempts to enlist the help of Blue to find the culprit, but Blue resists, not wanting to rat out his friend. The reaper eventually finds Hamal, and a sacrifice of sorts ends the second act of this quick-paced (only 128 pages) book, leaving the reader with a satisfying third act and epilogue. I think the best thing about this book is its ability to never feel too heavy or scary. Even when things look bad for our main characters, the dread does not last long, and the payoff is satisfying. I’d say that our main baddie is a bit too frightening for very young ones, thus I give it the old 13+. Another good thing about this book is that it is very inclusive. When we present at conventions on comics in the classroom, we constantly get, “Can you recommend any titles geared toward the LGBTQ community?” This is one of those titles! Very serious about readers being able to find themselves in stories, Keezy Young works to incorporate queer characters. I long for the days when we do not even think twice about LGBTQ incorporation…when it’s just as normal as anything else. I never understood why people make such a big deal about queer characters in stories anyway. We love whom we love, and that should be good enough for people to accept. The art in this book is bright and bold. It has a slight pastel fantasy aspect to it that I love. The book does a good job of allowing you to understand that even though things go in seemingly bad directions, the characters are going to be OK. The colors almost work like an up-beat film soundtrack. Things might look bleak, but the music tells you how to feel, and if the music isn’t telling you to be sad or scared, odds are, you’re fine. Same with the colors here. This is ultimately a great story about love, loyalty, and sacrifice. It’s nice. It’s pretty. It should find a spot on your classroom shelf because students will read it, and they will take something away from it.